Although, I was getting a little R&R in the foothills of the Adirondack; I was still negotiating, writing and planning. Did I mention we are collaborating on a video series about entertaining? It’s going to be such fun, and I hope to have one “in the can” sometime in the fall. I’ll be keeping you posted about “The Inspired Table.” I also have some little changes planned for “The Ace of Space,” we are going to focus on becoming more of a lifestyle blog. 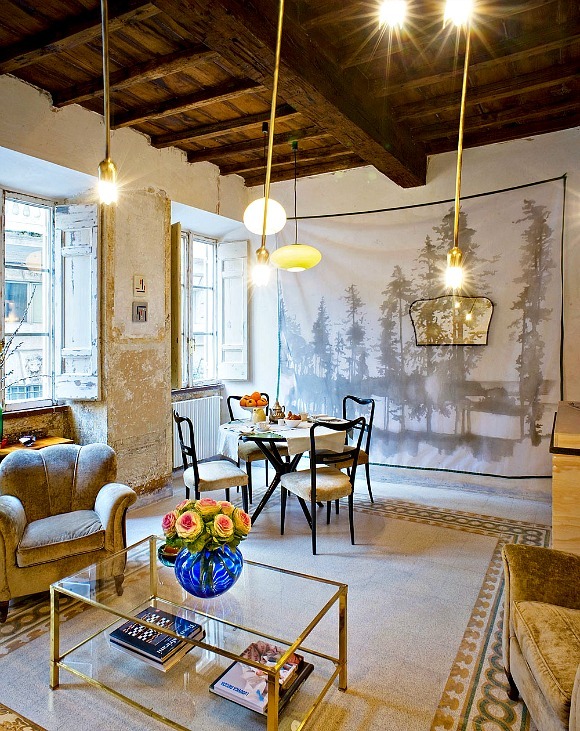 We’ll be covering interiors and entertaining, with a little “dash” of travel in the mix. All of which I am truly passionate about. I would be remiss if I didn’t mention that I learned my entertaining skills from the best, my parents were pros at hosting the perfect party. In fact, I would say that my mother was the original “hostess with the mostest,” and who doesn’t love a perfectly executed dinner party? I came back from NY last week with her notes, seating charts and drink recipes that I’ll be sharing. To those of you who know me, travel is in my blood. So I was thrilled to start a new series a while back called “Haute Hotels,” focusing on Boutique Hotels from around the world. Of course, it’s always appreciated when someone reaches out to me because I can’t be in all places at all times (sadly). 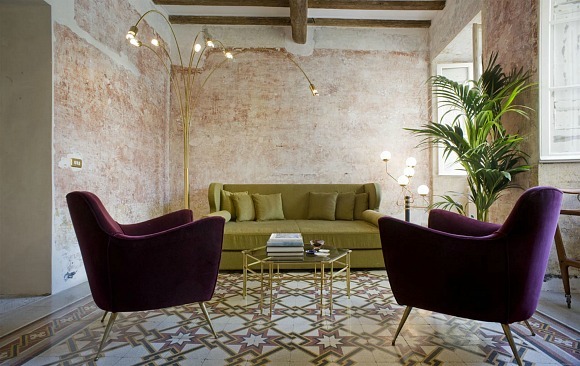 So back in April, I was contacted by the recently opened G-Rough Hotel in Rome, Italy asking if I would be interested in reviewing their unique hotel. After seeing the pictures, I agreed. G-Rough has taken a somewhat unconventional approach to hotel design, and as such are so deserving of industry accolades. 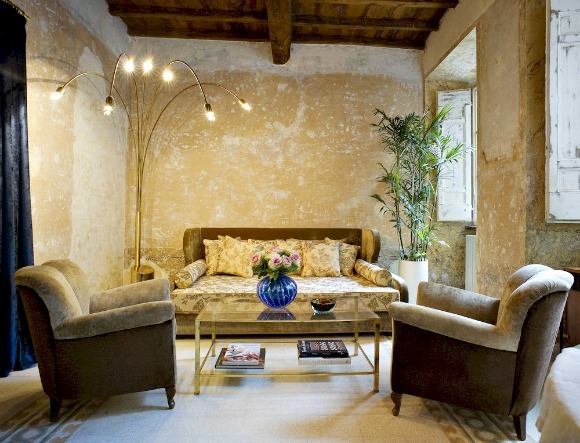 Housed in the “antique frame” of a 1600’s Roman building, ten apartment-sized suites showcase furniture designed by iconic Italian designers from the 1930’s to the 1970’s. 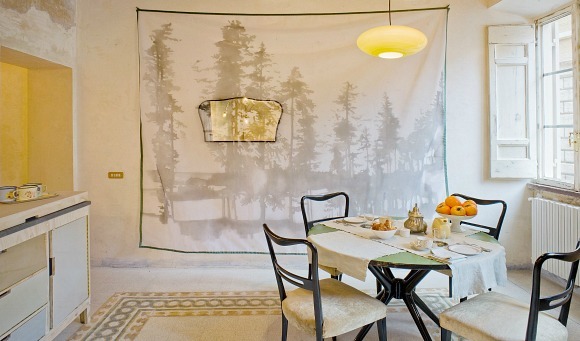 Iconic furnishings are paired with a rotating art exhibit by up-and-coming Italian artists all carefully curated by the owners sister, Guendalina Salini. This unique offering of suites is at times youthful and fresh with an abundance of old world charm. It is located outside the Piazza Navona, which is dear to my heart since it is where Mr. B and I began our whirlwind honeymoon tour that took us throughout Italy. Undertaking the preservation of the historical bones of the building, architect Giorgia Cerulli was chosen to bring an idea to life, leaving the “rough luxe” of the structure intact, hence the name G-Rough. The renovation retained the original features such as the tiled or parquet wood floors, wooden beams and time-worn walls. A preservationists dream come true. 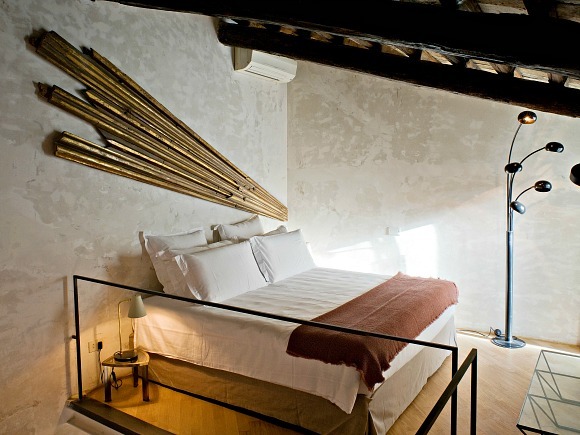 It is a place that has been added to my travel bucket list, and one day I look forward to immersing myself in all the unconventional luxury that this “Fellini-esque” hotel has to offer. 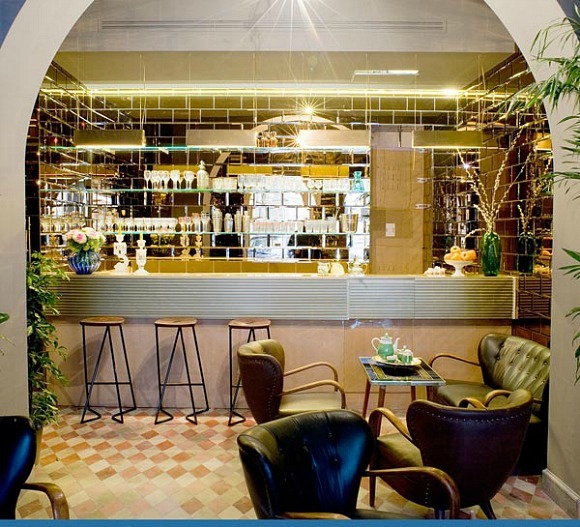 The newly renovated hotel bar with chic Italian designed furnishings, a mirrored bar back and original tiled floors dating back to the 1600’s. The perfect intersection of old world and modern design. 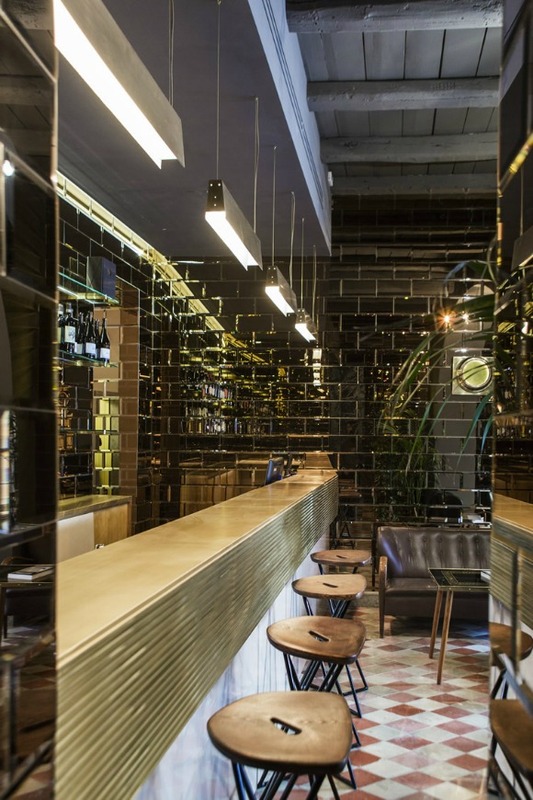 A typical wine cellar greats you when you open the front doors, complete with a brushed-brass counter, faded bronze mirrors and a collection of vintage pieces. 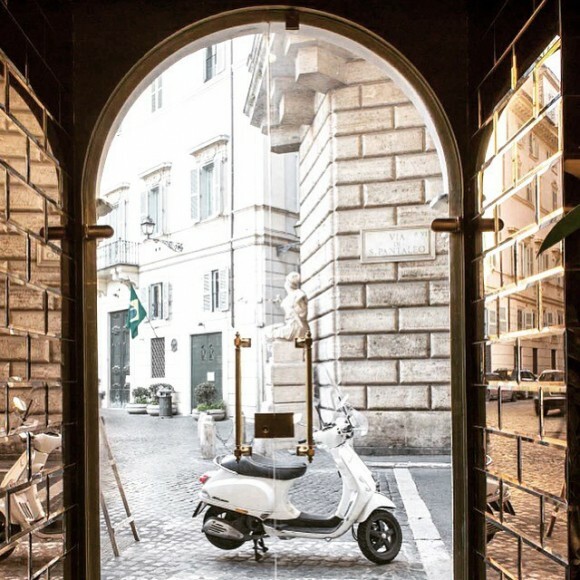 I can imagine enjoying a glass of Prosecco and a plate of stuzzichini (Italian appetizers) at the wine bar after a long day of seeing the incredible sights of Rome. 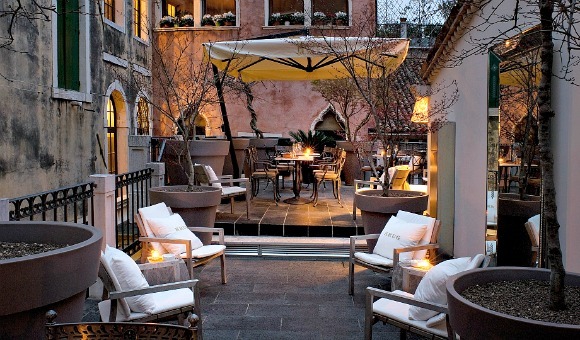 Or enjoy a quiet evening out on the well-appointed terrazzo underneath lush branches, fronds and foliage. A suite at the hotel with vintage Italian designer pieces, forgoing traditional room numbers each suite is named after a designer. 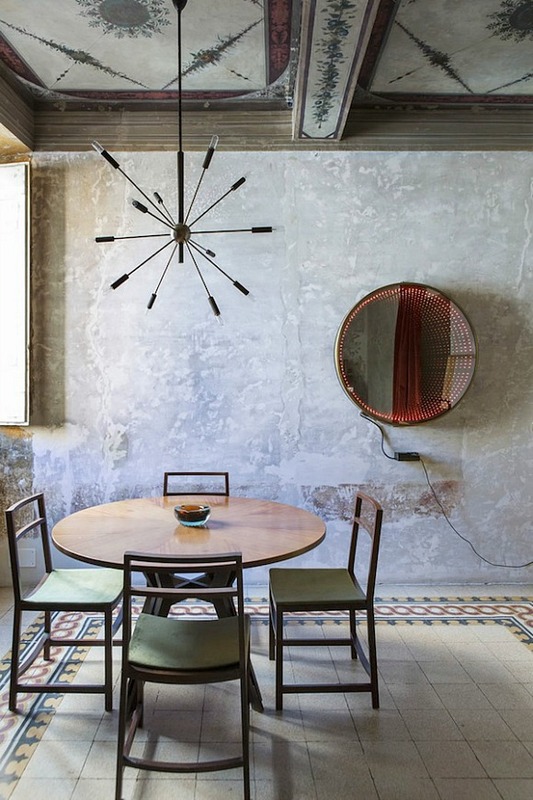 Contemporary furnishings anchored by original time worn tiled floors. 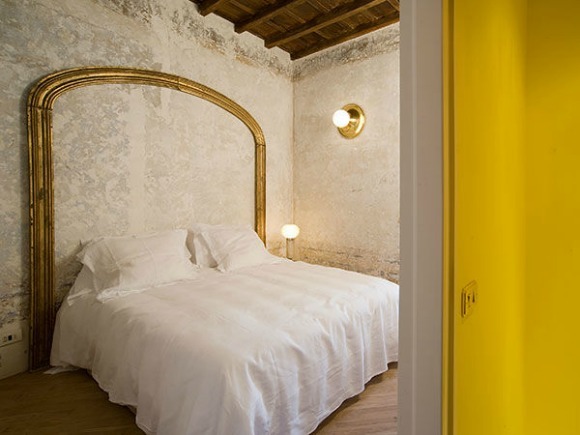 The walls of hotel retain the original patina, the architects opted to make only minor changes, leaving the original walls to tell some of the buildings centuries old history. This architectural fragment is all the wall adornment needed. A simple gilded frame serves as a headboard. An idea that can be successfully replicated in homes throughout the world. 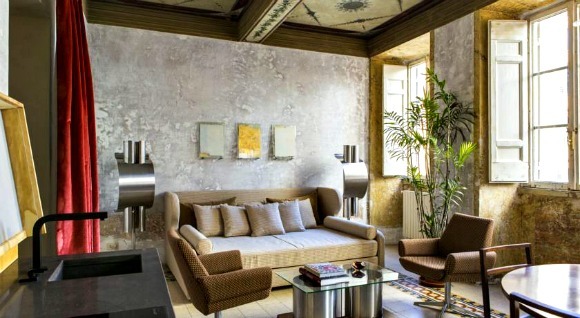 One of the features that is so breath-taking are the ceilings with the original frescoes. The simply yet modern furnishings blend seamlessly with the architecture of the space. 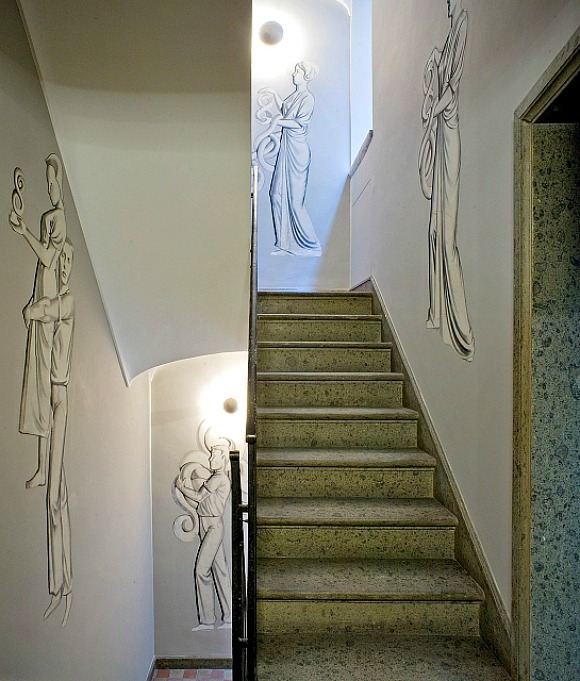 One of the suites showcases a life size piece of artwork amid the modern lines of the Italian designed furnishings. 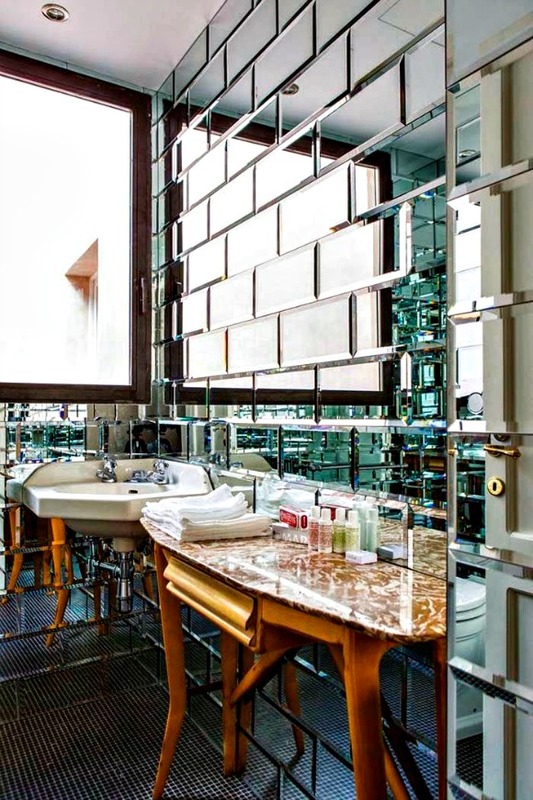 One of the ensuite bathrooms, complete with mirrored tile and a retro-fitted vanity. I hope you enjoyed a brief tour of G-Rough, for more information you can visit www.designhotels.com/g-rough. I am excited to see and read about your “Haute Hotels” however, I can’t wait to see some of your Mom’s seating charts, etc. Best to you Vicki.